I walked my daughter Cate to school this morning. It’s her first year at a big school – she is on her fifth day of kindergarten and it is the only year she’ll ever share the same hallways as my older daughter, Taylor, who is in fifth grade. Taylor had safety patrol this morning so she went into school earlier. 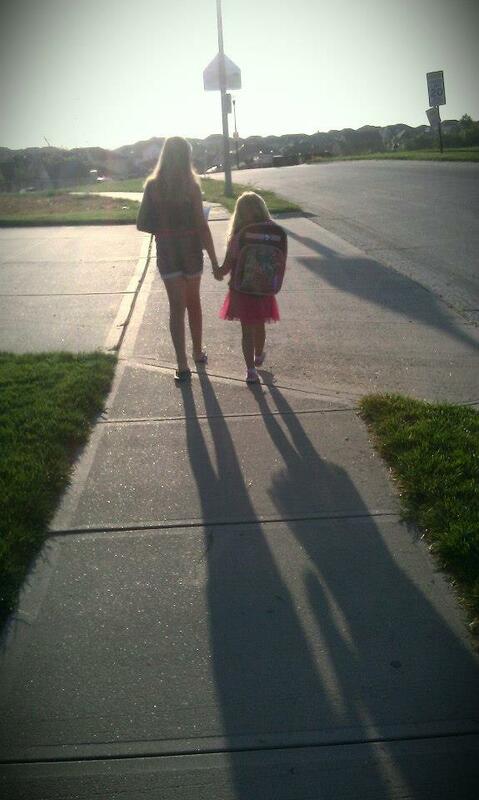 After a bowl of cereal and some grapes, Cate and I decided to walk the the 1/2 mile from our house to her school. It is one of those little moments that was insignificant by all appearances but is one that I’ll never forget as long as I live. From the sun shining in her mop of curly blonde hair, and her blue eyes sparkling. She clasped my hand in hers eagerly when we started up the hill, her bubbly voice never stopped talking the whole walk. Every so often she’d squeeze my hand, twice, and look up at me and smile. She’d spontaneously break into a skip and tug on me gently to follow her. From behind, you can see that her backpack is easily half her size, strapped over both her shoulders, her lunch and school folder neatly nestled inside but she carries it easily. And when we got to the school and got closer to the doors, she suddenly squeezed my hand two quick times, pulled me down for a kiss on the cheek and without a word she bounded off, getting swallowed by the crowd of kids headed for the entrance. And I stood there watching, feeling a tug at my throat, my little girl so courageously going forward alone. And when she was almost to the door she turned and we met eyes, a big smile lit up her face, and then she was through the door. I stood there for a few long moments watching the rest of the kids head inside before starting for home again. When I turned around, my older daughter stood just behind me, heading inside from her safety patrol job looking so mature and so suddenly grown up. And I was a touch sad by how fast it seemed to happen, but so proud that it had. She gave me a smile, unaware of the moment I had just had in just looking at her, but she gave me a quick hug as she hurried past me, giving me the same look as her sister had before she walked in the building. They’d never looked so much alike. And not in their features, but in their expression of confidence. This hits so hard with me, Carrie. My daughter is now 9 and heading into the 4th grade. All of a sudden she looks and seems so….grown up. Yet she still likes to hold my hand at times and be snuggly. I value and cherish those moments because I know that eventually she's going to get so big she won't want to hold mommy's hand anymore. Crazy how the time passes so fast…..